The applications were advertised in the East Anglian Daily Times on Tuesday 3rd February and letters of objection should be in within 21 days of that date, i.e. 24rh February. Your committee is working on a detailed list of objections. The Society will be writing to all Babergh Councillors on the subject and we will keep you up to date with any action we take, but your support is vital if we are to keep Tesco off the riverside site and protect the environment of our town. Please remember there are three applications, so please send a letter for each of the application references, to the Planning Department at Babergh District Council, Corks Lane, Hadleigh. Documentation is available for viewing on weekday at the Babergh District Council Offices (9-5) and Hadleigh Town Council (930-1230)-. The site for the store itself is the same as the 1999 application, the store area being 2618 sq metres, the store and service yard stretching from the edge of the current Brett Works buildings to the back of the Cinch lands. Between the store and the river is the parking for 202 cars and a small planted area between the car park and the river. The total area of the site, excluding the Dawson site, textile building and access road is 5.91 acres or 2.39 hectares. These are the application numbers for the proposals as they stand at the moment. The case officer for these proposals is Martin Price. Location Former Brett Works (Pound Lane), land rear of 109 High Street, Part O.S.3371, Part Babergh District Council car park and part Bridge Street allotments. 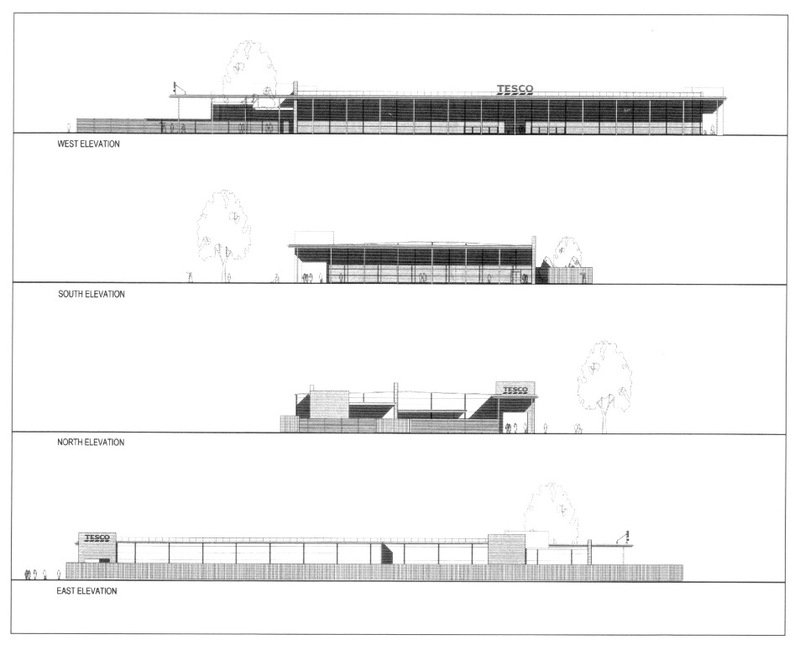 Proposal Erection of Class A1 food store with associated landscaping, service yard and car parking, access to Bridge Street through Babergh District Council car park – Scheme 1. Location Former Brett Works (Pound Land), land rear of 109 High Street, Part O.S. 3371, Part O.S. 4373, Part curtilage of Greenways (No 7), No. 9 and Part curtilage of No. 11 Bridge Street, Hadleigh. Proposal Erection of Class A1 food store with associated landscaping, service yard and car parking, access to Bridge Street between Nos. 3 and 11 ( No. 9 to be demolished) – Scheme 2. Proposal: Application for Conservation Consent – Demolition of dwelling and garage. Above the roof level on the North and West sides of the building are large Tesco signs, presumably illuminated but not identified as such. At the entrance to the site in Pound Lane is a plain wall with Tesco on it. Rendered walls on the North elevation of the service yard, and the ‘freestanding arched bookend at the north west corner of the building, terminating the shop front and drawing the eye to the corner of the building should be rendered to reflect local vernacular and coloured in a suitable pastel shade’. The access road takes off from Babergh’s Bridge Street car park across the Town Council’s allotments (it is not possible to identify how many allotments will be used) and (approximately) behind 113 High Street it divides to the car park and the service area. Off the service road is a spur road leading to the land at the back of Cinch and Sun Court. The junction entrance to Bridge Street is identified as being wide enough for four lanes of traffic with a central island. The Old Gas Works offices are left intact. The present exit from the car park is one lane wide. Question – how can that be extended to two lanes? The plan appears to show the entrance road taking over part of the Bridge, but the Bridge is listed Grade 2 and there is no planning application for listed building consent nor conservation area consent to change the Bridge. This plan does not show any changes to Bridge Street nor is there any sign of traffic control in Bridge Street. The access road takes off from just in front of The Old School across to the gateway of 13 Bridge Street. It shows single lanes of traffic with a road island in the middle and a wide visual splay. On either side of the entrance to the new road Bridge Street is shown as being wide enough to take a third / central lane where traffic would wait before turning. There are no signs of any other traffic controls in Bridge Street. This road having crossed the meadows then follows the same path as Scheme 1 when it services the store. There is no Conservation area planning application for removal of part of 11 Bridge Street. The plans do not show any land to re-site the Town Council Allotments and the parking places that will be lost from the Babergh Car Park. Scheme 1 is dependent on Tesco acquiring part of the Town Council Allotments. At the date of writing there has been no approach made to the Town Council to purchase any part of their allotment site. In 2003 Tesco’s representatives showed this proposal to the Town Council and the Council voted by a large majority not to sell their Town Lands. At the last meeting of the Town Planning Committee with one vote against it was agreed to recommend to the Council that the Town allotment land should not be sold. Scheme 2 depends on the demolition of Mr and Mrs Alvarez’ home at 9 Bridge Street. Last year developers made offers to Mr & Mrs Alvarez to buy their home and were told that it was not for sale. They have made it quite clear that they do not intend to sell their home. It would appear that to acquire the land for either of the access against the will of the owners of the land would require Babergh District Council to obtain the lands by Compulsory Purchase and pass them on to the developers. We do not know what action is being taken at Babergh about the sale of part of their car park. 4. Transport assessment plus 2 books of appendices from Boreham Consulting Engineers. 7. Archaeological Desk Based Assessment from Lindsey Archaeological Services. 8. Interim Design Statement from Lyons+Sleeman+Hoare. We are slowly working our way through these documents to formulate the Society’s objections. On first glance there are a number of errors and omissions. The simplest document, the Archaeological assessment has many errors in it. Had they consulted with our own Town Archives and Sue Andrews the document would have held few errors and been up to date. The flooding assessment is being looked at carefully. A great deal of work was put into this by the Society at the time of the planning inquiry. The assessment notes that the bottom of the site and the Babergh car park is liable to flood, hence the siting of the building to the east of the land, which on the current Environment Agency map does not flood, although the previous Ministry of Agriculture, Food and Fisheries map showed flooding to that site, and on Bridge Street flooding as far as the Old School. The current flood plain map shows that the Babergh Car Park floods and the flood assessment document suggests that there will need to be an escape route for traffic, but no escape route is shown. The Transport Assessment does not appear to show any difficulties in getting articulated delivery lorries on or off the road from Bridge Street. If any members have expertise in this area we would be pleased to receive their help, but we will be looking at this very carefully. We do not at the moment have a copy of the retail assessment although the overview assures us that ‘The overall health and vitality of Hadleigh Town Centre would not be damaged, it would be enhanced’ If that statement were to be true then Hadleigh would be unique as Tesco have succeeded in closing down small food shops and changing the face of High Streets in every other town in the country where they have opened a store. We note the latest situation in North Walsham, Norfolk, where the newspapers report that the District Council has had to reduce the rates on small shops to attempt to keep their High Street viable. We hope that this brief look at the Tesco application is useful in helping you formulate your objections. At the moment petition forms are in the shops, and if you can get any signatures we are happy to provide you with forms. We do not yet know when Babergh Planning Control Committee will be discussing the application but we understand it will probably be around August so we will continue campaigning until the date of that Committee meeting. On Tuesday 3rd February the Hadleigh Society History Group gave a presentation of their research into the Highway Robbery in Hadleigh that took place on Wednesday 9th March 1825. Using contemporary reports, they told a fascinating tale of the event, interspersed with accounts of the social conditions of the time that gave rise to crime, and details of how the law dealt with offenders. On Monday 15th March with Roger Kennell. Both Hadleigh and Holland-on-Sea appear in Doomsday. Today they are about the same size, but they developed very differently. Roger has studied the histories of both towns in some detailand will draw some interesting comparisons. Having been entertained by him on many previous occasions, we look forward to an entertaining evening.